It’s unanimous. The “Historic Tampa Cuban Sandwich” is now officially Tampa’s signature sandwich. The reading of the resolution and the vote by Tampa City Council took less time – about 2 minutes – than it takes to order a Cuban at some of Tampa’s more popular lunch spots. Councilwoman Yvonne Yolie Capin also wanted to trademark the term “Historic Tampa Cuban Sandwich.” However, she decided against the trademark when she found out the it would require anyone using the phrase to get city permission. “The idea of the trademark was to protect the original ‘Tampa Historic Cuban Sandwich,’ not limit or stop the creativity that comes with the culinary business,” Capin said. But, it gave Council Chairman Charlie Miranda an opportunity for some good-hearted ribbing. The meat-laden sandwich of marinated pork, Genoa salami and sweet ham is now defined, authenticated and official. Tampa City Council will vote today on a resolution “designating and authenticating” the “Historic Tampa Cuban Sandwich.” But, Miami’s Cuban community disputes Tampa’s claim to the sandwich. The mixed meat sandwich, originally called a “mixto”, became popular in Tampa among Cuban cigar factory workers in the late 1890s and early 1900s. The resolution specifies the ingredients of the authentic Tampa Cuban sandwich as sweet ham, mojo-marinated roast pork, Swiss cheese, dill pickles, mustard and Genoa salami. The birthplace of the Cuban sandwich isn't Havana, or even Miami...it's Tampa. 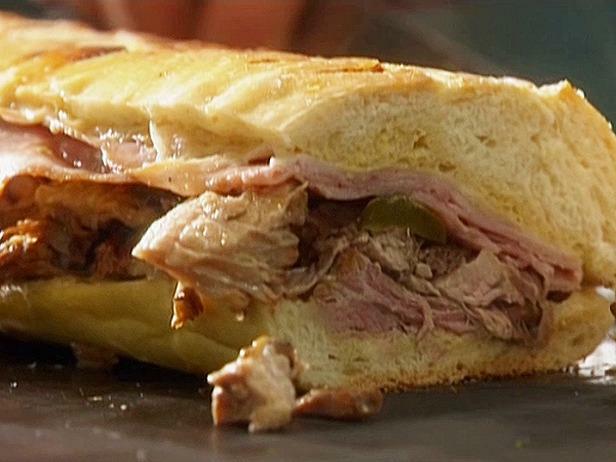 Watch David Audet, Cuban sandwich afficianado who has researched the history of the sandwich. The sandwich itself consists of sugar-cured ham, shredded pork marinated Cuban sytle, Genoa salami, Swiss cheese, yellow mustard, sour pickle and authentic Cuban bread. O.K., anyone who knows anything about the Cuban Sandwich knows it started in Tampa's Ybor City a century ago. Cuban immigrants mixed with Italians, Germans and others to develop the pressed delicacy -- with Cuban bread, shredded pork, glazed ham, swiss cheese, Genoa salami, a pickle and mustard. So why do folks in Miami have such trouble with the idea that Tampa is laying its rightful claim on the sandwich? Yes, they may have more Cubans...but we were there first. You might already know about the Tampa City Council resolution to define a Cuban sandwich as the "Historic Tampa Cuban Sandwich." But did you know they might try to trademark it? It's on the Tampa City Council agenda for Thursday. The City's legal department is scheduled to provide a report "on whether or not the City of Tampa can acquire a trademark for the 'Historic Tampa Cuban Sandwich' as being Tampa's signature sandwich."